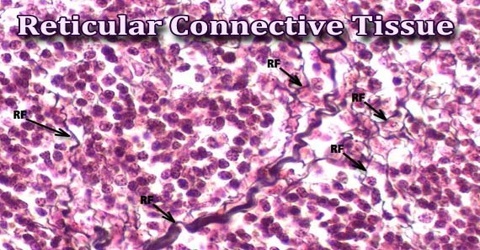 Reticular connective tissue is a type of tissue found in the body that is supported with a branching framework of collagen fibers known as reticular fibers. It is also called retiform tissue. 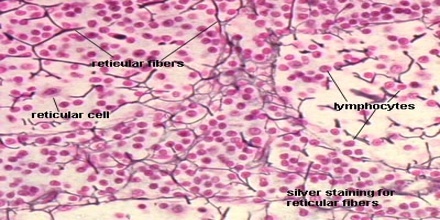 Reticular fibers are not unique to reticular connective tissue, but only in this type are they dominant. Reticular fibers are synthesized by special fibroblasts called reticular cells. The fibers are thin branching structures. Connective tissue consists mainly of long fibers embedded in noncellular matter, the ground substance. The density of these fibers and the presence or absence of certain chemicals makes some connective tissues soft and rubbery and others hard and rigid. Compared with most other kinds of tissue, connective tissue has few cells. The fibers contain a protein called collagen. Connective tissue can develop in any part of the body, and the body uses this ability to help repair or replace damaged areas. Scar tissue is the most common form of this substitute. There are more than 20 types of reticular fibers. 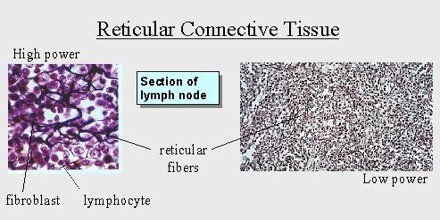 In Reticular Connective Tissue type III collagen/reticular fiber (100-150 nm in diameter) is the major fiber component. It forms the architectural framework of liver, adipose tissue, bone marrow, spleen and basement membrane, to name a few. Reticular connective tissues are arranged along with different cells in various organs like bone marrow, lymph nodes, spleen, liver, kidneys, and even under the skin. These tissues have a peculiar feature; they never exist alone. Reticular fibers present in the tissues are fragile and together bond to form a meshwork or a fibrous skeleton (stroma). The tissue structure looks quite similar to that of elastic connective tissue. The only difference is that collagen fibers are branched in reticular tissues, whereas they lie parallel in the elastic ones. The structural framework of collagen lattice in reticular tissues provides great strength and support to the organs of the human body system. Like other types of tissue in the body, the reticular connection tissue is constantly broken down, recycled, and replaced with new tissue. Cells within the lattice will break down when they are no longer able to function and new collagen strands are constantly being generated to replace strands that have broken up. Specialized cells are involved in the formation of new reticular fibers and the maintenance of existing fibers that are already part of the collagen lattice in the reticular connective tissue. The most important function of this tissue is to provide support to the organs, tissues, and individual cells like adipose tissues and muscles. Other functions include filtration of various body fluids in organs like spleen and lymph nodes. Reference: thefreedictionary.com, wisegeekhealth.com, buzzle.com, wikipedia.